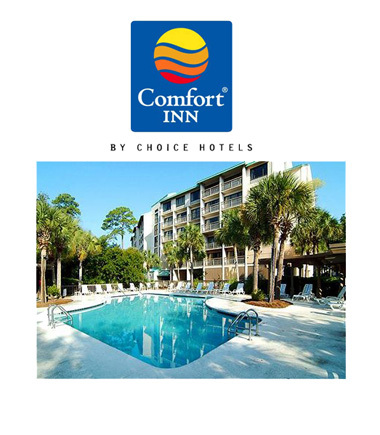 "Comfort" is exactly what comes to mind when envisioning the Comfort Inn South Forest Beach in Hilton Head, SC. This hotel is strategically placed on six acres of southern wooded land where the guests can enjoy pristine views of unspoiled lagoons surrounding the property. We are conveniently located across the street from the coligny beach; close to famous golf courses and just steps away from shopping, restaurants and nightly entertainment. Hilton Head Airport is only 8 miles from the hotel. Hot breakfast is included and the hotel also features an outdoor heated pool, which is exceptionally nice if you are travelling in off-season. Please contact the hotel directly at 843-842-6662 and ask for the special rates for HHIGA tournaments. Rates ranges from $62 - $139 depending on the season.